High-resolution models have transitioned from research into forecast operations, helping forecasters utilize additional mesoscale information after accounting for the inherent unpredictability of many small-scale phenomena. This module covers the major capabilities and limitations of models run without a convective parameterization using grid spacings of around 4 km or less. Model forecast interpretation issues are discussed, including introducing convective mode diagnostics such as updraft helicity and interpreting the forecast as an event prediction rather than as a precise point forecast. Many examples are shown and twenty interactions engage the reader throughout the module. Ok the lesson was pretty good. Great info and helpful. The test was HARD. It was just a confusing test with some double negative type questions. A harder test though is a generally a good thing...i just felt like I was wading through the questions and trying to just figure out what it was. Not bad but could be more clear. The lesson was a bit lengthy, but it had a lot of very useful information. 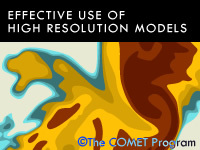 I enjoyed using it to learn about high resolution models in forecasting. There are also interactive questions that make the large amount of reading a tad easier to digest. Information can be fileld with tecunical jargon and hard to follow at times. This module follows along nicely with the rest of the modules in the NWP course. Its focus on convection in high res. models corresponds well with what has already been covered. Most simply stated, it's always best to use the model as a tool and not as the rule. The many case study scenarios provided do the best at portraying the strengths and weakness of the high res. model.